I hope everyone had a fabulous holiday and got all the goodies you wanted. I certainly did and I thought I’d share a few of my favourite pressies with you. The cat is made by Protopye and I love her creations I already own a plutotian a mold monster and a bunny rabbid made by her so the scratchy cat will certainly not be lonely here. 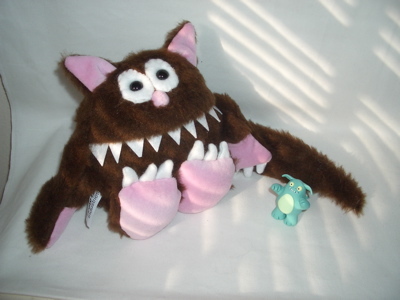 The little guy is called Skippy and he is a happy beastlie made by Beastlies and he is utterly fantastic, and probably is the first of many more. So thanks Matt I have wanted these guys for a while so I was thrilled to get them. 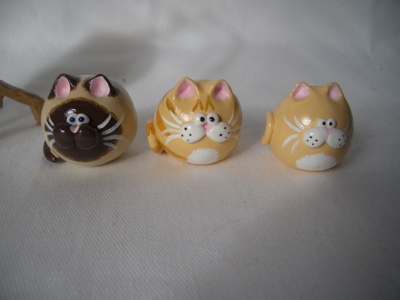 These little guys were made by Bubbletime and they are so cute and the perfect recreations of my favourite little troublemakers Kirzstie, Floyd and Lewis. 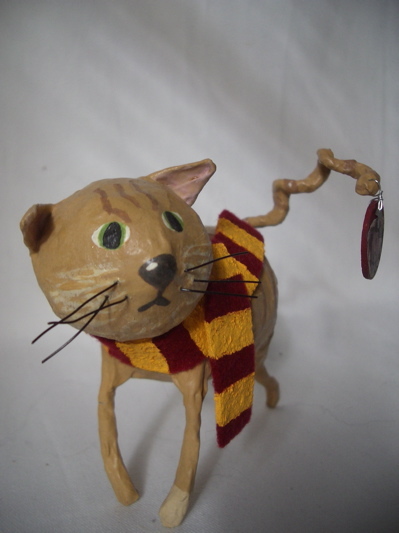 This is Crookshanks made by MissBeahavin from papier mache and then all hand painted. I love him so much, she is so talented…. I love everything in her etsy store and so I am having to show great restraint right now as I want to buy a couple more………gaaaaah. 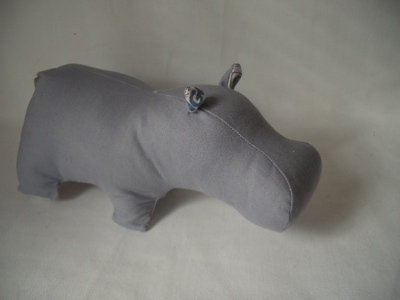 The little hippo is one of my Renegade holiday craft fair goodies. He is so cute and has very cool belly fabric that I wasn’t smart enough to take a piccie of dur!!! anyway he is made by qylaar and he is fab. 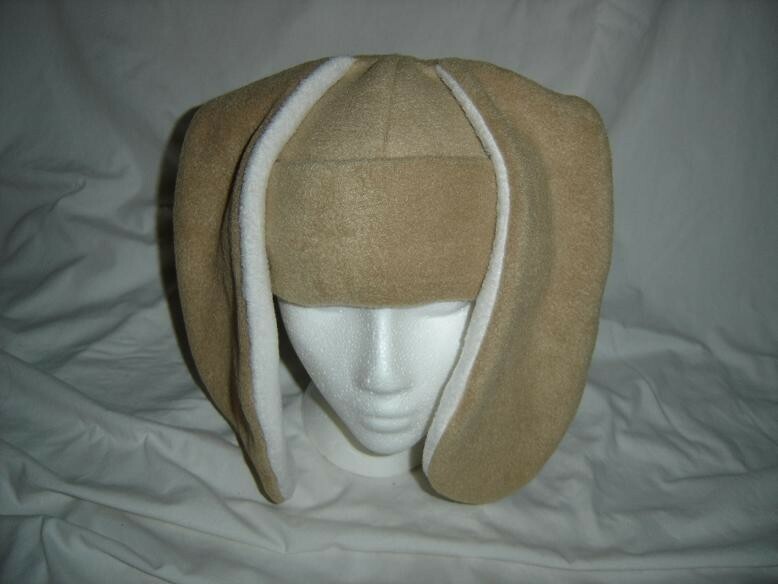 My bunny ear hat by boho butterfly I so can’t wait to wear this out and about. 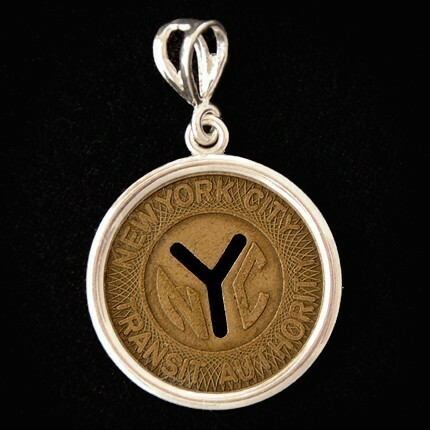 I’ve wanted this New York subway token pendant by aminyitray since I first started on Etsy and Yaaaaay it’s finally mine. It’s even cooler in person too. You should check out her etsy store as she has the coolest and oddest stuff, definitely unique. The donuts are so cool and I am rather addicted to them, they bring my collection of kid robot donuts to 6 now. The best thing about them is that they are made by Heidi Kenney of My Paper Crane fame. 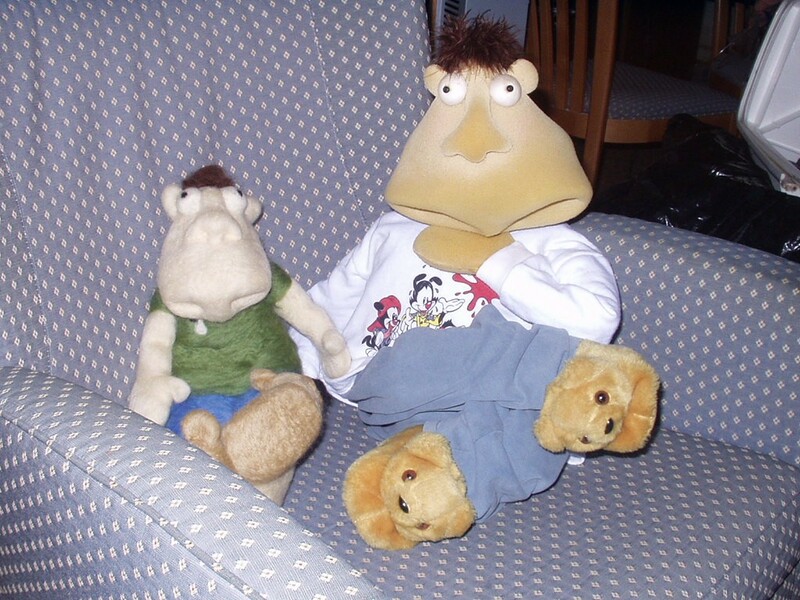 And if you have never heard of her I highly recommend you slap yourself silly for about an hour……..nah I’m just kidding (kind of) but she has really rather fab stuffed toys and they can be found in places like Renegade Handmade. 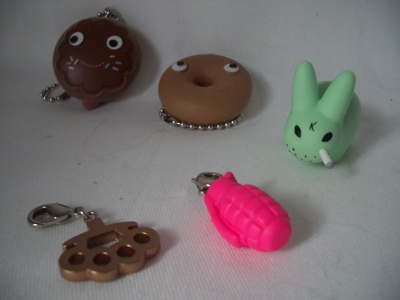 The green smoking bunny is a snorklin and the nuckle duster and pink grenade are zipper pulls…….how awesome are they? best stocking stuffers ever!!! And last my 2 goodies from the Christkindlmarket that we went to in Chicago before Christmas. 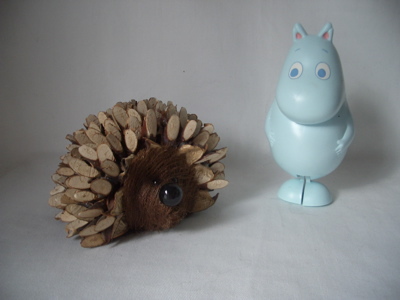 The little hedgehog is so cute and the blue guy is a moomin. I was so excited when I saw him I used to love the moomins as a kid but I had never seen merchandise for them before……dontcha just love hand made goodies. I think he was a great idea……even though it wasn’t mine. And he looks great as part of my Christmas decorations. So really I have been taking it easy and enjoying lots of crappy Christmas movies in the afternoon and drinking a ton of yummy hot chocolate and staring at all my pressies under the tree and resisting the urge to rip them open. Merry Christmas everyone and a fantastic New Year to all. The open mouth picture I found a real challenge, but I think I captured Tramp fairly well…….I just hope Kristal thinks so too. Chicago is…….especially at Christmas time, despite the sub zero temperatures……….brrrrrrrr. How cool is that? The apple store was great (hardly surprising) I played with the i-phones (drool) for ages and put stabbies.com on every free monitor………teehee. We also attended the Renegade holiday Craft fair and I got lots of goodies (again already wrapped under the tree) Let’s just say that this year I certainly have held up my pledge of buying handmade this holiday season. The place was packed, the Renegade folk certainly know how to promote a show. I think they look like brothers. It’s nice to see one of my critters in their new home, and I know Nick much prefers Israel to the Mid West, he was far too cold here in his little shorts. Christmas trees, hanging ornaments and kittens are not the best combination. I love having a really big real tree. It smells fantastic and makes me feel really festive……..and you know decorating it is one of my favourite things about Christmas. I remember where I got every single ornament (no small feat as I have a ton) and I like to remember each one as I hang it up. I thought I’d share some of my new ones with you. First is the little yellow light bulb from poor lost bread. This is the ornament I bought from the Madison Craftacular….and I love him to bits. The little blue glass polar bear I got from the Winter Art festival in Madison, it’s by Craig Bacon Studio. It was a tough decision on what to get from him as he had lots of beautiful hand made glass ornaments but I couldn’t resist little Knut (as I call him). Of course in blatant self promotion you can also see my little green and red retro ball in the top of the picture and I made a larger Santa Claus just for myself…. I realise this isn’t the best piccie but hopefully you can make out the polymer clay pickle and mushroom ornaments from stars dreams and jewels I also got her chilli ornament, and I think they are wacky and fantastic on the tree. 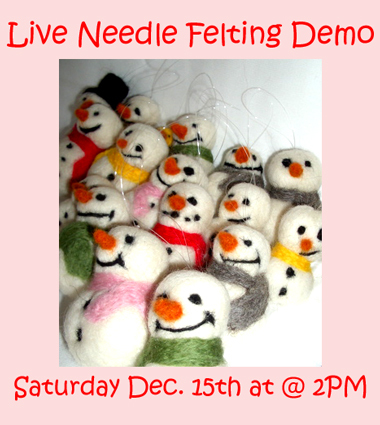 The felt trees, reindeers and snowflakes I bought from Michaels last year. Believe it or not they came in a pack of 3 for $1.00 so of course I bought a ton of ’em. I got the idea for linking them together and I was going to create a hanging screen of them but with cats it just wasn’t very practical……….so I invented this festivy chandalier and I love how it looks. 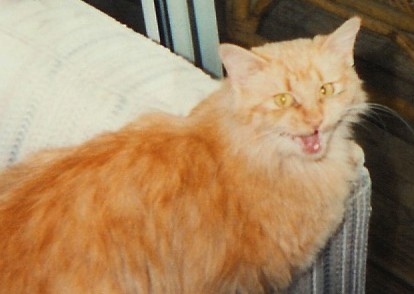 You are currently browsing the Stabby Critters weblog archives for December, 2007.